Ships from Israel. Most customers receive within 4-18 days. Based on 14nm Kaby Lake (7th generation) architecture, the Intel Celeron G3930 is a great choice for value-conscious users looking to build PCs for online gaming, and mainstream home and office uses. It incorporates two computing cores, delivering the performance needed for day-to-day tasks – manage social media, connect with friends, surf the web, and even multitask efficiently and smoothly. It supports Intel Virtualization Technology (VT-x) technology, Intel AES New Instructions, and more. The integrated Intel HD Graphics 610 is great for everyday applications like browsing visually stunning webpages, streaming 4K Ultra HD video, and editing photos. Based on Kaby Lake architecture and with 14nm manufacturing process, 2MB Cache and Intel HD Graphics 610, the latest Intel Celeron processors give your platform the computing and visual power you’ve wanted. You can now multitask - i.e., watch movies/games and Skype at the same time and still have power for your other activities. Protection capabilities in the Intel Celeron processors are built from the ground up to give you a device you can trust. Every time you start it up, secure boot with Intel Platform Trust Technology helps keep your device safe, blocking dangerous programs, so only trusted software is launched. You get peace of mind with a more secure operating environment. Execute Disable Bit defends against ever-elusive malware, reducing your exposure to viruses and malicious code attacks. It works behind the scenes, so you don’t have to think about it, and it shuts down malicious code before it can take root. This item is covered by Slava Computers Return Policy. Cons: - Overheats easily with any overclock (this is not a cpu one needs for overclocking). In use every day for last 10 months. Frequently runs Chrome browser with 12 or more tabs open while playing casual games on one of the tabs. Without closing any tabs, can also watch Youtube video (or Xfinity TV streaming, or Netflix streaming), or create Word documents, while running Avast anti-virus scan at same time in background with no slowdowns. It stays cool the whole time. In other words, it has proved itself to be a very capable everyday processor for home use including some multi-tasking. Going back a few years we would never have bothered with a Celeron processor because they were just too weak. With this new generation G3930 we continue to be impressed with how efficient and economically it handles everyday tasks. A true bargain if ever we've seen one. Be sure you have plenty of RAM - these days 8GB or more - and an SSD as these two items help ensure your system isn't bogged down when running several things at once. Very capable dual-core for all basic internet, office productivity and even casual gaming. Roughly twice as powerful as a Core2Duo of similar speed in your old PC, and draws less power, generates less heat. For example, the very popular old Core2Duo E6750 achieved a Passmark cpu score of Complex - 1731 / Single Core - 1008. With the new Celeron G3930 Passmark cpu score is Complex - 3271 / Single-Core - 1697. These are very satisfactory marks which, when coupled with 8GB of RAM and an SSD, will give you a quick, responsive system for normal home computer work. The E6750 cost over $100 when new, while the Celeron G3930 is clearly more powerful, runs cooler and costs around $45 or less. It also has Intel Quick-Sync feature which helps the processor handle video and photo editing or transcoding to other formats. It's just great that we can now have a capable processor for under $50. Cons: Noisy heatsink/fan. This thing hums like a lawn mower in the distance. Other Thoughts: Replaced GF's 8 year-old Core2Duo E6750 with a new motherboard, new DDR4 RAM and this cpu. Unfortunately, the Corsair CX-430 power supply proved incompatible. After replacing that with a later model Corsair CS-450M everything works OK. The stock Intel cooler that came with the G3930 is quite audible, although it cools the cpu, no problem. Pros: Used in a mining rig, so needed whatever was cheapest. and it comes with a heatsink. amazing for the price. Cons: there are times where even doing simple things on the OS cause it to chug for a bit, but i rarely need to do anything locally. Cons: - Availability: this one sells out often! - Customer Service from 3rd party seller. Other Thoughts: Great CPU - I'd recommend it to anyone looking for inexpensive, non-gaming use. Great for a media center or basic web surfing PC. MAKE SURE YOU BUY DIRECTLY FROM NEWEGG. I got burned by a 3rd party seller (Hot Deals 4 Less). Ordered 2; the CPUs never arrived. All I got for my $$$ was bogus tracking info and the run-around from their support. Filing a claim with Newegg Support and my bank now. 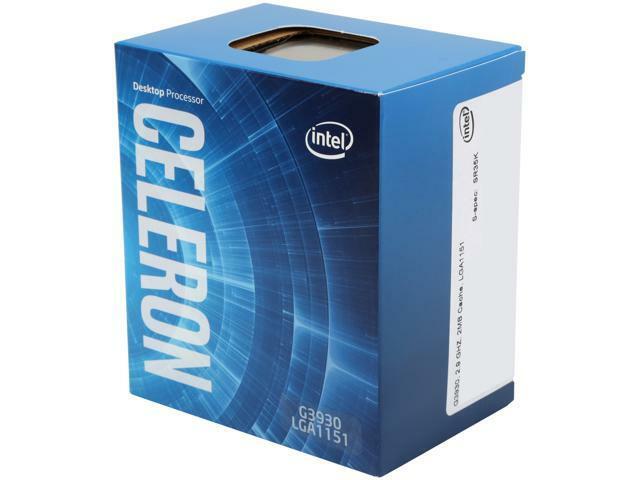 Other Thoughts: Celeron or a Pentium is all you need for a mining rig, don't waste money on i3 or higher if your just putting it in a mining rig. Other Thoughts: Installed and using with windows 10. It is pretty easy to get this to 100% CPU usage. Unzipping large files sometimes will come to a halt due to the CPU not having the power to go through like an i3 or i5 just keep in mind they will cost a tad more. For building a simple PC that will just use windows or some other OS and mining software (GPU mining), this does it. Low cost, low power use, and low heat are all what you need to keep costs down. For internet browsing and office work, this can handle it, just get enough ram to make things a bit smoother. All in all, no complaints. been running in my mining rig for a while and temps are low and everything is good so far.